Jimmy’s place is so relaxing and the Thai food excellent. Although the menu might not be as big as some Thai restaurant, there are plenty of choices. The portions are good too. We went with friends on a sat night and the place was packed and people kept coming in! One of the waiting staff did let him down that evening so the wait for food was slightly longer but no issues. We returned again early March with my parents and the food was also brilliant again and a new staff- very attentive. Now we have booked to go again this weekend. Can’t have enough of this good Thai. And so local too. We had a lovely Thai meal here. The surroundings are slightly quirky, stylish and comfortable. We also came a while ago for lunch and had wonderful tea and sandwiches. I had the coronation chicken and it was memorably good. The Maypole hasn't been open all that long, but I would thoroughly recommend. We had an excellent Thai meal in the Maypole. Quite inexpensive, and lovely atmosphere in this intimate and nicely furnished restaurant. I understand the Thai meals operate on Thurs,Fri and Sat. During the day it is a Tea room including Chinese tea with English lunches. A bit of an eclectic mix. 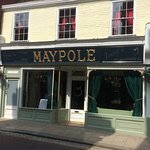 Been to Maypole? Share your experiences!